Today internet and storage devices have become an important medium for sending the windows application programs from one system to another. Thus the setup generator utility helps software programmers or developers to transfer their application program from on system to another. Our Setup Creator provide solution for transferring your computer programs easily as compare to other setup maker installation programs. 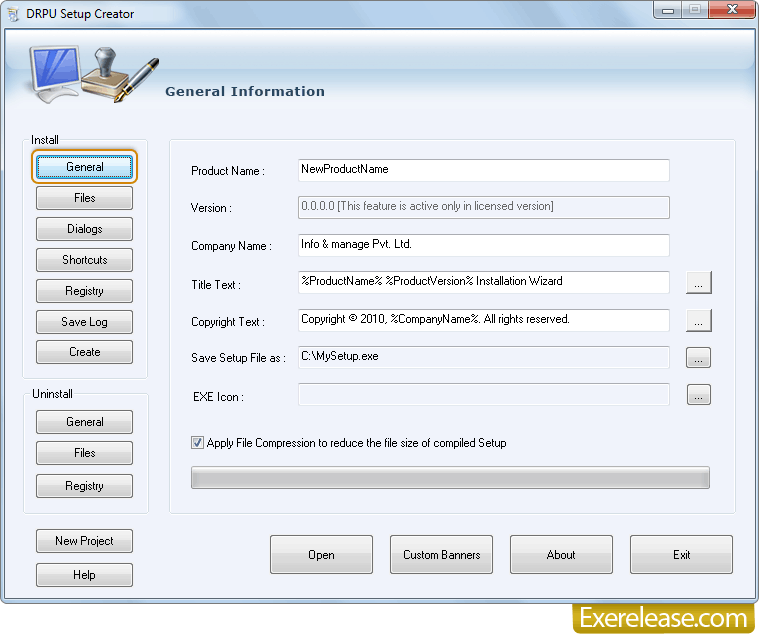 Setup Creator software package converts your complete program into executable file setup, enabling you to easily distribute your software package through different transferable medium. Setup Creator has simple, fast processing and easily creates the executable setup of your computer software program. Setup Creator wizard even maintains the integrity of your program and creates self extracting executable file without changing the functionality of the software. You can create the setup of all application software developed in any programming language. Easily and efficiently creates the executable setup of your computer programs. Have both Install and Uninstall setup creating facility. Covers the entire feature and functionality of your application program. Customize the Dialog box and generate the compact setup in order to have an easy installation. Professional and create the setup of all the application software developed in any programming language. Have fast setup generating feature and maintains the characteristics of the software while creating the setup. Setup Generator has both Install as well as Uninstall setup creating features, providing you the facility of not only making the executable setup for your program but also offering you to have the uninstall setup procedure for your software product. Setup has compact size, takes less space and enables you to easily install your application program. Generated setup even carries all the essential features of your application program.